Saturday, April 6, 2019 Update for everyone. Here is the latest Hrrr model future-cast radar. Notice, this is not one line of storms and you are finished. We could have off and on thunderstorms tonight into Sunday night. Tonight’s storms could produce dime to nickel size hail, lightning, and heavy rain. Isolated severe weather risk tonight. Sunday’s storms could produce damaging wind and large hail. There is a non-zero tornado risk. This is one model’s opinion. Don’t take it for specifics as much as the general idea. Several rounds of storms are possible on Sunday. Today’s update won’t have all the value-added long range graphics and other. Today’s focus will be on the risk of strong to severe storms over the coming days. Not available today. Spring and summer outlooks. 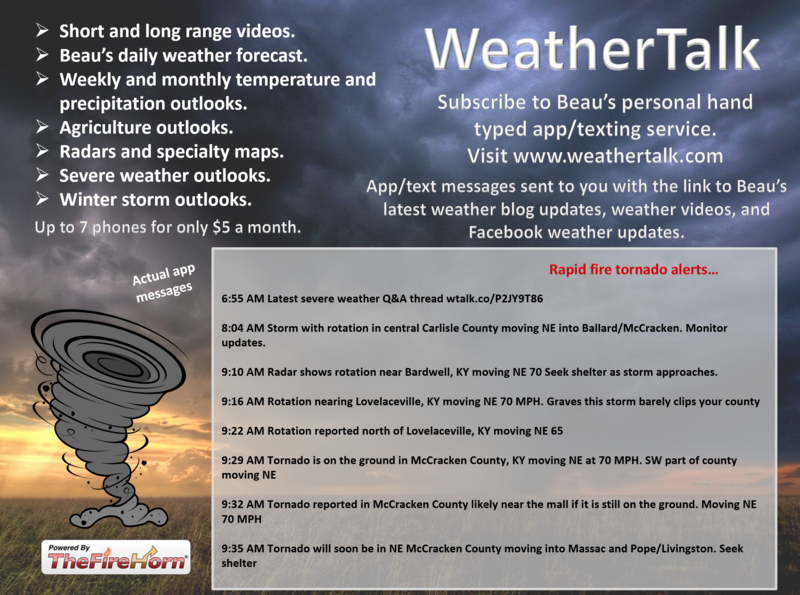 Here are the latest graphics. Today: Monitor tonight. Some scattered thunderstorms with locally heavy downpours, lightning, and hail will be possible. There is a low-end risk of hail exceeding the size of nickels. Tomorrow: Yes. Thunderstorms on Sunday and Sunday night could be intense. A few storms could become severe. There remain questions about coverage and instability. Confidence in storms producing quarter size hail or larger and/or 60 mph wind gusts is low. There is a non-zero tornado risk, as well. Low-end risk. Is lightning in the forecast? Yes. Lightning is possible tonight, Sunday, Sunday night, and Monday. Is severe weather in the forecast? Possible. Some storms could be severe late tonight into Sunday night. I am monitoring Monday. The main concern is hail and strong winds. Is Flash flooding in the forecast? No. General river flooding will continue. Is lightning in the forecast? Yes. Lightning is possible on Thursday/Thursday night. Is severe weather in the forecast? Possible. I am monitoring late Wednesday night into Thursday night. 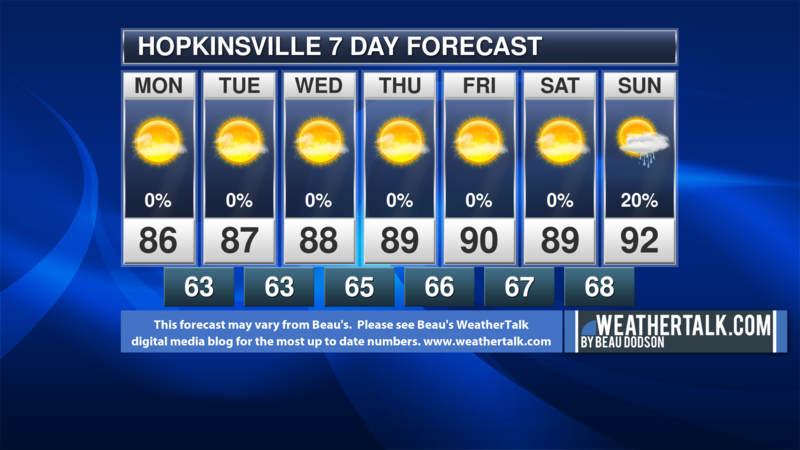 A cold front will push through the region. If we have enough moisture return then storms could be severe. Saturday’s Forecast: ** IF clouds are thicker on Saturday then temperatures will likely only climb into the upper 60’s** A mix of sun and clouds. An isolated shower or thunderstorm possible during the afternoon over southeast Missouri and the Bootheel. Lesser chances across the rest of the area. Mild. Wind direction and speed: Southeast during the morning at 4 to 8 mph. Winds increasing during the afternoon from the southeast at 7 to 14 mph. Gusty, at times. Coverage of precipitation: None during the morning. 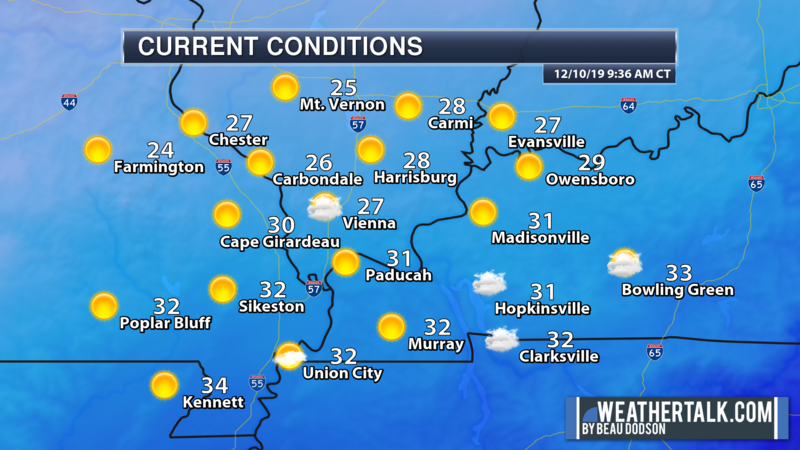 Isolated during the afternoon over southeast Missouri and the Bootheel. Lesser chances across the rest of the area. What impacts are anticipated from the weather? For most of the area, none. A few wet roadways possible late in the day over southeast Missouri and the Bootheel. Lesser chances across the rest of the area. Saturday night Forecast: Thickening clouds. Showers and thunderstorms developing from the southwest. Most of the storms will arrive late at night. A few storms could be intense with gusty winds and hail. Locally heavy rain is possible. Coverage of precipitation: Scattered to perhaps numerous. Increasing coverage overnight. What impacts are anticipated from the weather? Wet roadways. Lightning. A few storms could produce high winds and hail. Should I cancel my outdoor plans? No, but monitor radars during the evening hours. Sunday’s Forecast: Windy. Warm. A mix of sun and clouds. Scattered showers and thunderstorms. Locally heavy rain is possible. A few storms could be severe. There remain questions about instability and coverage on Sunday. Clouds and rain/storms may keep instability down. If that occurs then the severe weather risk will be minimal. If we do have some sunshine then the risk of severe storms will increase. Overall, confidence in severe weather is low. Coverage of precipitation: Scattered to perhaps numerous. What impacts are anticipated from the weather? Wet roadways. Lightning. Gusty winds near storms. Monitor the risk of severe storms. Should I cancel my outdoor plans? I would have a plan B. Monitor radars and updates. Sunday night Forecast: Cloudy with scattered showers and thunderstorms. Locally heavy rain is possible. Some storms could be severe. Monitor updates. There are some questions about precipitation coverage on Sunday night. Overall, confidence in severe weather is low. What impacts are anticipated from the weather? Wet roadways. Lightning. A few severe storms are possible during the evening. Monitor updates. Monday’s Forecast: Quite a few clouds. A chance of showers and some thunderstorms. What impacts are anticipated from the weather? Wet roadways. Lightning. Some locally heavy downpours are possible. Should I cancel my outdoor plans? I would not cancel. I would monitor radars and updates. Rain is possible. Monday night Forecast: Quite a few clouds. A chance of scattered showers and some thunderstorms over our eastern and southeast counties. 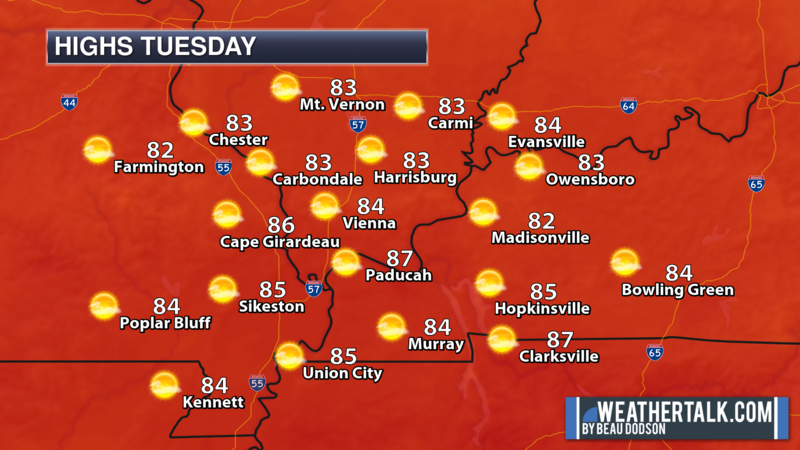 That would mainly be across western Kentucky and western Tennessee. The further east/southeast you travel the greater the chance of spotty showers and perhaps thunderstorms. Precipitation chances should be winding down. Coverage of precipitation: Scattered (mainly our eastern and southeastern counties). Ending. What impacts are anticipated from the weather? Wet roadways. Lightning. Thursday: A mix of sun and clouds. Windy. A chance of a thunderstorm. Mild. Highs in the lower to middle 70’s. Lows in the upper 30’s to middle 40’s. South and southwest winds at 25 to 40 mph. Winds becoming west overnight. Gusty. Today and tomorrow: Thunderstorms are possible tonight into Sunday night. Thunderstorms tonight could produce dime to nickel size hail, lightning, heavy downpours, and gusty winds. Storms on Sunday and Sunday night could produce hail and high winds. There is a low-end tornado risk. 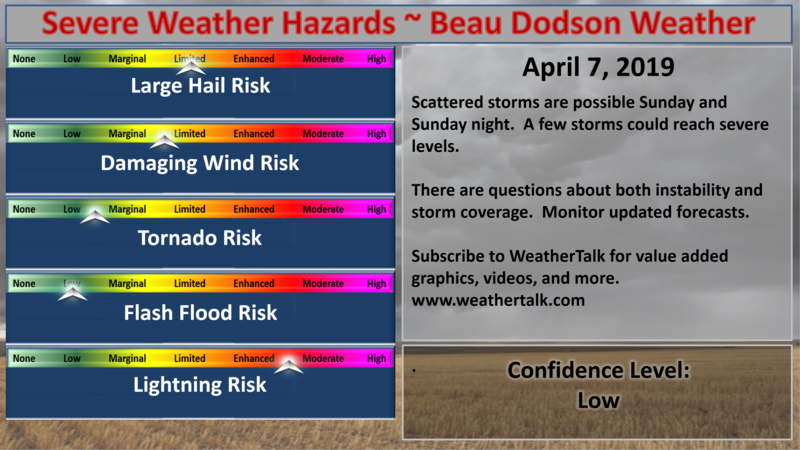 There remain questions about how unstable the atmosphere will be on Sunday and Sunday night. Monitor updates. A few warnings can’t be ruled out. Monday through Saturday: Thunderstorms are possible on Thursday. Monitor updates. Colder weather Thursday night into Saturday night. No severe concerns during that time. Thunderstorm chances enter the picture tonight into Monday. Another chance of storms by Thursday. Strong winds on Wednesday and especially on Thursday/Thursday night. Winds could top 40 mph on Thursday. No major changes in the going forecast. I did increase high temperatures on Wednesday. I added the mention of strong winds on Thursday. Yes. Thunderstorms are possible tonight. Lightning is the main concern. Some reports of hail will also be possible. A few downpours. Storms will be scattered. 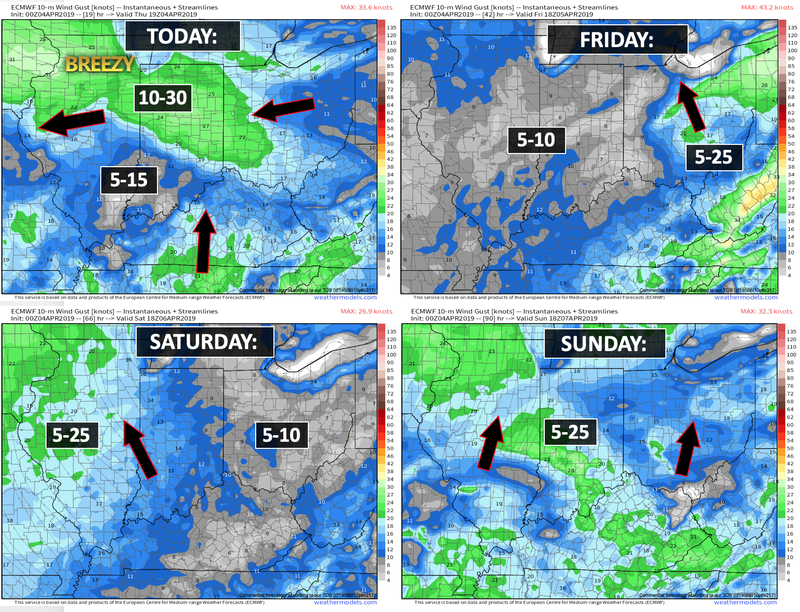 If you have weekend plans then monitor updates concerning the Saturday night and Sunday time-frame. There are some concerns that a few storms could be intense on Saturday night and Sunday. Monitor updates. We have some fog in the region this morning. Use care. A storm system is taking shape to our west and south. This system will help our temperatures climb today and tomorrow. 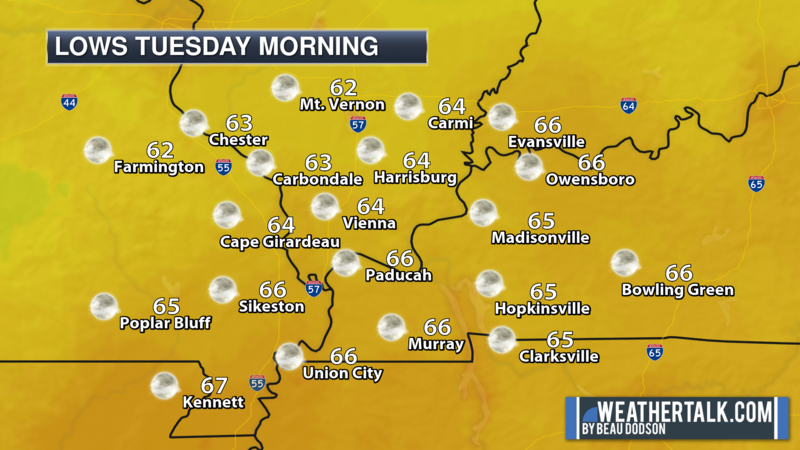 Today’s highs will likely be in the 70’s area-wide. Temperatures will be several degrees cooler where clouds linger. Here are the 9 AM satellite and radar views. Notice that line of storms in Texas? That complex in Texas may actually push all the way into our region by late tonight. I am watching that as it moves east and northeast today. This could block some moisture tonight. If the moisture is blocked then our risk of heavier rain and stronger storms would be reduced. This happened the other day, as well. These Gulf of Mexico thunderstorm complexes tend to block better moisture flow from moving northward. 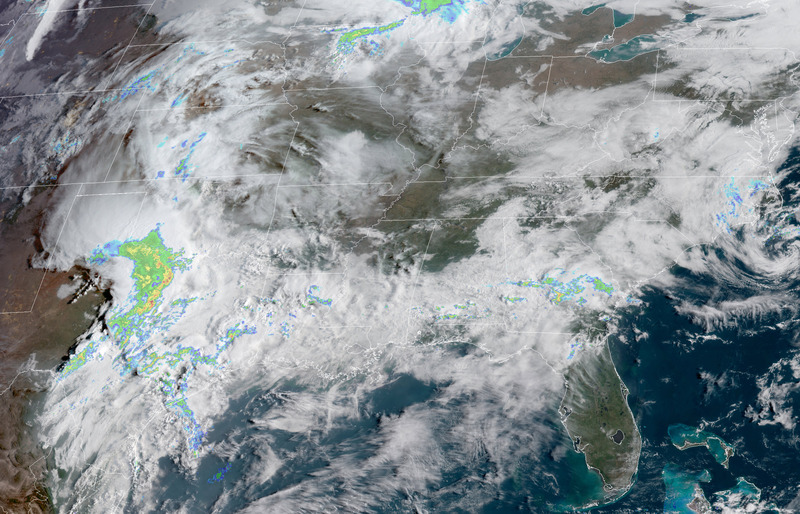 Click to enlarge the satellite/radar image. White are clouds. The colors represent precipitation. We should see thunderstorms develop tonight into Sunday morning. Those storms will push into the region from the southwest. They will be moving northeast at 15 to 30 mph. Storms tonight could be locally strong. Perhaps below severe levels. I can’t, however, rule out some reports of small hail and 40 mph wind gusts. Here is what the NAM 3K model is showing. This is its future-cast radar. What it believes radar might look like. Time-stamp upper left. You can see the band of storms in Arkansas pushing northeast. These are some of the storms that will need monitoring tonight. This only takes us through tonight. This won’t be exact but you do get the general idea. Scattered storms are possible tonight into Sunday morning. The overall severe risk tonight is low. Hail is the main concern. Gusty winds. Lightning, of course. As we move into Sunday the forecast becomes a bit more complex. Clouds and morning showers/storms could help keep instability down. You need instability for severe weather. With that said, we have a risk of some severe thunderstorms on Sunday/Sunday night. The main concern will be large hail and high winds. The tornado risk is not zero, but it is not all that great, either. As always, monitor updates. It only takes on storm to ruin the day. Sunday is the kind of day where you could have more than one thunderstorm. It likely won’t be one storm and it is over. The cold front will remain to our west through Sunday night. If instability does develop on Sunday then the risk of severe weather will increase. This will be a now-cast. What is a now-cast? It is forecasting weather in the short-term (12 hours or less). Typically, on severe weather days, we have to monitor morning clouds and rain. We do that to see if they will clear out in time for instability to redevelop. Here is the NAM 3K model future-cast radar that takes us from Sunday morning into Sunday night. Notice that this model does not show much happening Sunday afternoon or evening. This will need to be monitored. Overall confidence in how Sunday/Sunday night unfolds is rather low. Other models show more activity than the NAM. None of that adds confidence to the forecast. Monitor updates. 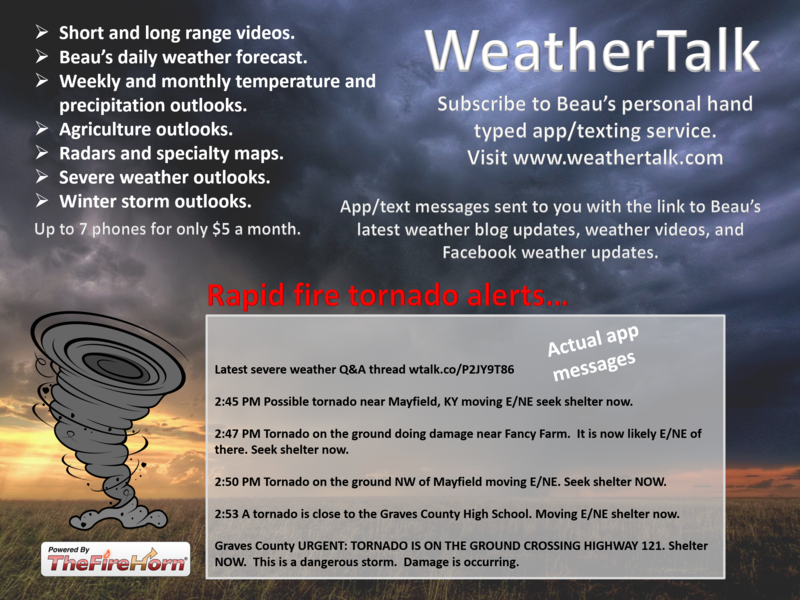 I will be sending out app/text messages if severe weather develops. Again, this is just a model and its opinion. Take the general idea from it. 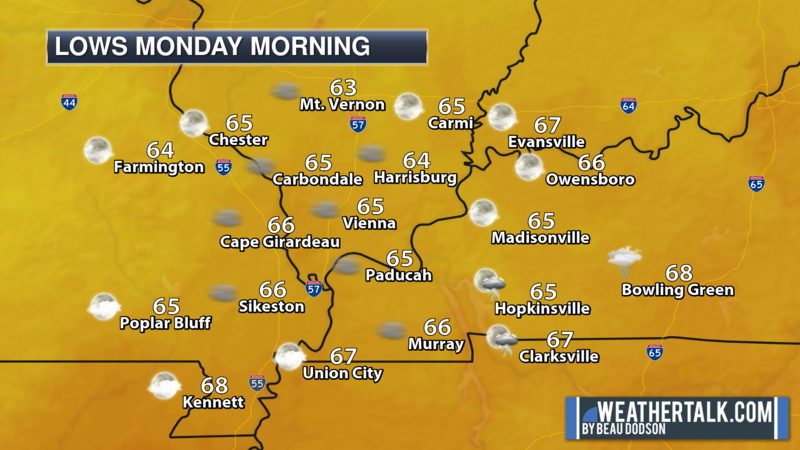 Scattered showers and storms will be with us into Sunday night. By Monday the storm system will be pushing through the region. This will bring an additional chance of showers and thunderstorms. By Monday night the shower and thunderstorm chances will be diminishing west to east. 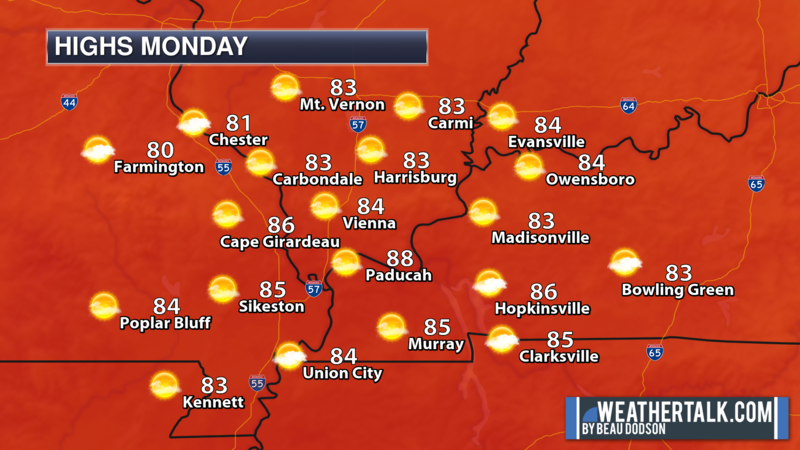 For now, severe weather appears unlikely on Monday. Monitor updates. A powerful winter storm will take shape by Wednesday and Thursday well to our west and north. A deep area of low pressure will develop in the Central Plains. That low will move northeast into the Northern Plains and the Great Lakes. The system will drag a cold front through our region with much cooler air behind it. Here is that system on the GFS. There are questions about quality moisture return. If dew points don’t climb on Thursday then showers and thunderstorms may not form. This remains a question. This is a deep low and we should see at least some moisture return. Monitor updates. Notice how the line of showers and thunderstorms form over or near our region. That is the point the system pulls in enough moisture for precipitation. Blue is snow (to our north). Green and yellow are showers and thunderstorms. I am monitoring the risk of frost by Friday or Saturday morning. At this time, 30’s appear possible. Not sure we dip into the 20’s. Monitor updates if you have agricultural concerns. I posted these above. Scroll up. .These maps update several times a day. Occasionally, in between updates, you may see a duplicate day or one out of sync. 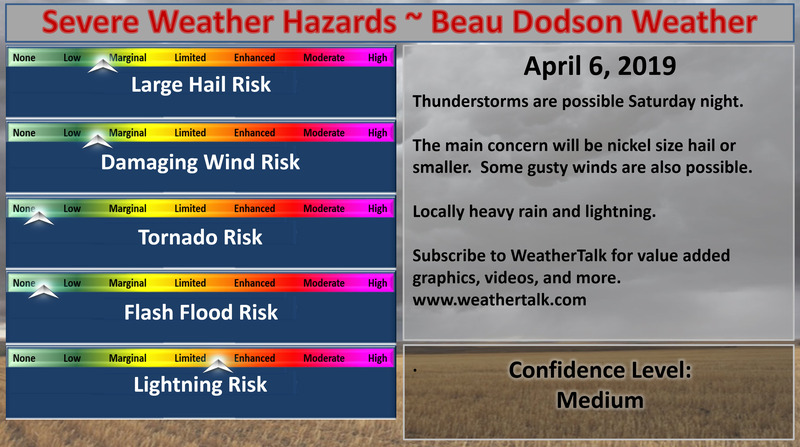 Tonight’s WeatherBrains is a special show regarding the NWS’s Hazard Simplification Program or “Haz Simp”. 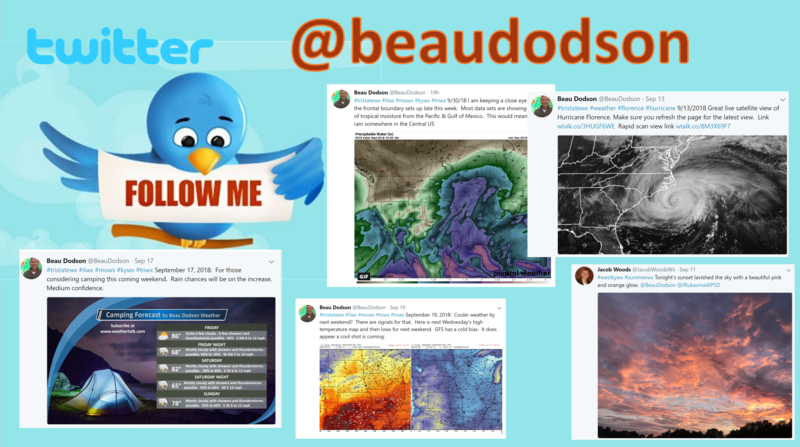 This program has been around for a couple of years and is designed to potentially redesign and reinvigorate the National Weather Service Watch/Warning/Advisory system. Our Guest WeatherBrain this week is a Social Science Researcher and Project Manager for Haz Simp along with Eli Jacks of the NWS. Her background is in meteorology, but her PhD program is interdisciplinary with a focus on sociology of disasters and risk communication. Danielle Nagele, welcome to WeatherBrains! Guest Panelist this week is soon-to-be graduating meteorology student from the University of Oklahoma. Jordan Overton, welcome to the show! Are “certain death” messages counter-productive? Why can’t the general public find their house on a map? April 5, 2019: Non-subscribers update. April 7, 2019: Storm update.